Hiveword Novel Organizer, to give its full title, is an on-line database for recording and displaying the structural elements of your story, namely its Characters, Settings, Items (such as magic rings or significant documents), Plotlines and Scene progression. The details of these elements are recorded on forms and can be displayed in Lists. In the case of Settings, Items and Plotlines, the forms are fairly basic with fields for just an identifying name and a longer description. The Settings form also provides a group of Geographical fields where you can specify City, State/Province and Country, should you so wish. The Character form is altogether more complicated with fields covering a host of details, ranging from the basics such as First Name, Middle Name, Last Name, Age, Gender, Importance (Major or Minor), Type (options such as Protagonist or Antagonist) and Occupation, to more psychological factors such as Religion, Wants, Likes, Dislikes, Fears, Habits, and a final Miscellaneous section where you can record such things as Birthday, Place of Birth, Education and Back Story. Once you’ve created a few such elements you can select the List view to have them displayed in List form. Here you can sort them into an order that makes sense to you, and choose between viewing just a list of their names or have the details for each element displayed as well, which makes for a more cluttered but also more informative view. A nice feature here is that only the fields where you have entered data are actually displayed, which goes some way to mitigate the inordinate number of fields on the Character form. Hiveword draws all these elements together through its Scenes. For Hiveword a Scene is a unit of action that takes place in one particular setting and involves one particular group of characters. As with any element each Scene has a Name, and there is a Summary field where you can describe what takes place. More important is the facility to select the Characters that are involved in the scene, which of them has the point-of-view, the Setting in which the Scene takes place, any Items involved, and which Plotlines are moved forward through the Scene. 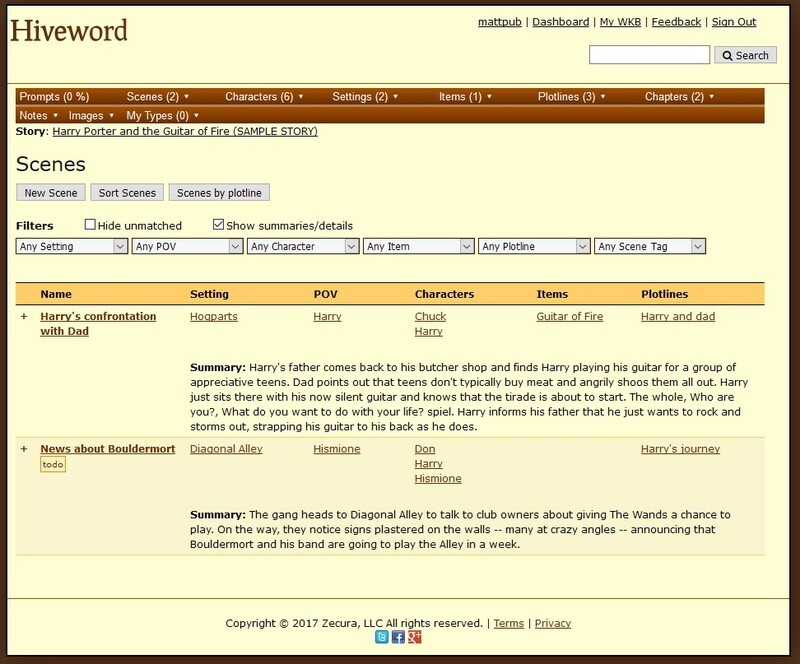 This is where Hiveword comes into its own, because switch to List View and you can choose not only to see your whole story laid out scene by scene, and change the order in which the scenes occur, but also filter the list to see just those that involve a particular Character, or take place in a particular Setting, or move forward a particular Plotline. This is a great way to highlight weaknesses in character development or inconsistencies in the plot, or to identify Scenes that are redundant or need additional work. Everything mentioned so far is available free of charge in Hiveword Novel Organizer. All you need do is create an account with a user name and a password and you can start building Story databases. However I would strongly recommend upgrading to Hiveword Plus which, for only $25 a year, adds a number of invaluable features. It is also here that Mike Fleming, the developer behind Hiveword, tends to make new features available first, and I for one am happy to support his efforts. For me the most useful feature added by the ‘Plus’ version is the ability to add your own custom fields to any of the Hiveword elements. For example, one of my Stories is quite specific about the dates on which particular events occur, so I have added a Date field to the Scene form. I have also added a Purpose field so that I can remind myself why that particular scene is necessary. Custom fields are particularly useful when it comes to Characters, and indeed I pretty well ignore the built-in fields in favour of my own which track factors such as the Choices made by the character as the story progresses, the character’s Wants, Needs and Fears, and a Character Arc field which helps me track the story as it affects that particular character (and reinforces the custom view available in the Scenes list). Apparently I am not alone in this in that Mike recently added the facility to hide built-in fields on the form display in response to a suggestion from another user. Mike continues to develop Hiveword, and indeed one of the application’s main draws is his open-minded approach to new ideas and willingness to engage with his users. The only major limitation is that Hiveword is a cloud-based application: it is accessed through a browser and relies on you having a reasonably good Internet connection. It is very responsive, but it’s not something you could use from – say – a deckchair on most beaches. That would require a full-blown client-side application, complete with a built-in synchronised database, which would be a major development challenge and likely to become less necessary as Internet coverage expands. As it is, I would highly recommend Hiveword and I look forward to whatever Mike does with it next. This entry was posted in Writing and tagged Hiveword. Bookmark the permalink. Could not agree more, Matt. I discovered Hiveword after I’d written my YA novel, but decided to utilise it while editing. I’d write random bits that I knew would fit into different parts of the story, and even had the ending finished before chapter 3 was written. After coming across Hiveword (and I can’t recall how I did) I thought I’d give it a whirl, but it was two years before I actually started using it and found myself becoming more and more excited as I progressed in my exploration of what it could do. I just wish that when you print a character profile it included the image of the character you have attached to it. Hmmm… maybe I should suggest that to Mike. I understand that Mike is already thinking about having Character images appear alongside entries in List view. Having them appear on the printed version makes a lot sense too.